I rode my bike from Chicago to New York in September. Packing list here, if you recall. I’ve avoided writing a blog post about it because, well, everyone has a blog post about their bike tour, it’s hard to make it interesting to a reader who didn’t go on the trip. Sure, for me, it was an epiphany, maybe the most rewarding two and a half weeks of my life. But mostly I pedaled and ate, which isn’t all that exciting to you. No mechanical problem, no outlandish tales of getting lost. What did I think about when I pedaled? Generally I thought about pedaling. So I’ll spare you the bike tour philosophizing. But if you want that anyway, I recommend Bruce Weber, Life is a Wheel: Memoirs of a Bike-Riding Obituarist (New York: Scribner, 2015). Instead, let’s look at some pictures. Here’s some extended kvetching about Chicago’s bike lanes. A while ago, I posted a controversial review of the new separated bike lane in Evanston–controversial because everyone loves new bike lanes and I used up a lot of space complaining about its new traffic signal arrangement. In retrospect, it was silly for me to complain about Evanston’s traffic signal arrangement, because the lights in the Loop are worse. Much worse! Let’s get into some nitty-gritty detail. I’m beginning a solo bike tour to New York on Thursday. Thus Chicago Bike Report goes on hiatus for a few weeks, as I trek through the wilds of Wisconsin, Michigan, Ontario, and New York. But you don’t want to hear about that, right? This is a cycling news and analysis blog. Wait–what’s that? You do have questions about my bike tour? Oh, I’m flattered. Let’s talk about my bike tour! What bike are you riding? Is it cool? Yes, it is cool. It’s the Prairie Chicken, my just-built, repainted, custom decaled 1987 Cannondale SR-400. An old racing frame that isn’t really suited to touring. Short chainstays, bad rack mounts, and barely enough clearance for 28c tires and a rear fender. But, like her namesake, she’s a scrappy grouse, and I think she’ll do just fine. The aluminum frame seems quite robust. The racks: an old, heavy-duty aluminum Jandd in the front and an Axiom DLX Streamliner Disc in the rear. The latter mounts to the brake bridge, owing to the lack of braze-ons. Let’s hope it’s sturdy enough! First, up to Manitowoc, Wisconsin. There I catch the ferry to Ludington, Michigan, and continue east through Ontario. From there I follow the Erie Canal across New York, then down south to the suburbs of New York, to my parents’ house. I’ll be following the Adventure Cycling Association maps part of the way. What are you bringing? Can you describe it in more detail than I care to hear? Right front: The kitchen. A cool Trangia camping stove, a 500ml Nalgene of denatured alcohol fuel, a plastic flask of rye whiskey, some water bags, a titanium spork, and food for the first couple days: oatmeal, couscous, tuna, 5 Clif bars, 2 gels (gross). And mounted on the front rack will be my tent, a Kelty Grand Mesa 2-person. All in all, the gear weighs 38 pounds. As far as weight distribution goes: the smaller front panniers hold denser items, so they’re about as heavy as the rear ones. Putting the tent on the front rack gives me slightly more weight in the front than the rear. That’s how I want it, because I’m wary of putting too much on the Axiom rear rack. This in spite of its stated capacity of 110 lbs. It seems like it’ll hold 25lbs just fine. But 110 pounds is nutty, and it’s only a matter of time before someone sues Axiom for making false claims. I had a few weeks with no obligations. Why not? I don’t anticipate being able to update the blog on the road, but expect a couple comprehensive posts at the end. Check back in a few weeks, and enjoy your rides in the meantime! The sunny and cooler trend continues Friday. DIVVY REPORT: S. Exchange Ave. & S. Saginaw Ave. still down. Up-to-the-minute updates here. 3.5 out 4, again. That means ride your bike! This is the last of Chicago Bike Report’s daily commute forecasts. Why? Because I’m sick of talking about the weather! Too much weather, not enough bike. So this blog embarks on a transition. In the future, expect to see more bike, less weather. Thanks for your faithful readership and support. Bigger and better things are ahead! Thursday, a time of cool weather and earlier sunsets. Note that low temperature. Plus the sun now sets at 7:35, apparently. The seasons, they turn, turn, turn. No, not really. It’s just pleasantly cool. Cool enough to mitigate at least part of your sweatiness. DIVVY REPORT: Attention South Shorers, the station at S. Exchange Ave. and S. Saginaw Ave. is down. Up-to-the-minute updates here. 3.5 out of 4. Again! A great day. August 23 bike forecast: a gorgeous day. Is Wednesday a good day to ride a bike? Overall: high 75, low 60, sunny as heck, moderate winds from all over the place, but generally north-ish. This is all very good, although the PM winds might bother northbound commuters. Tomorrow provides the sunny sky, but you’ll have to find the cat yourself. DIVVY REPORT: A new station opens at Perry Ave. and 69th in Englewood. All stations operational. Up-to-the-minute updates here. When the paved segment ends, carry your bike over a bit of gravel and you’ll rejoin the main path looking cooler than the LFT normies. Shiny buildings at the Active Trans Leadership Network mixer. Fun! 3.5 stars, which is outstanding. Ride your bike! Monday: new week, new weather. Bad weather, actually. And a solar eclipse. That means we’re packing more info into the weather infographic than ever before. Overall: high 85, low 72, with PM thunderstorms likely and winds from the southish. Lights. Because it’ll be dark! Duh! DIVVY REPORT: All stations operational. Up-to-the-minute updates here. 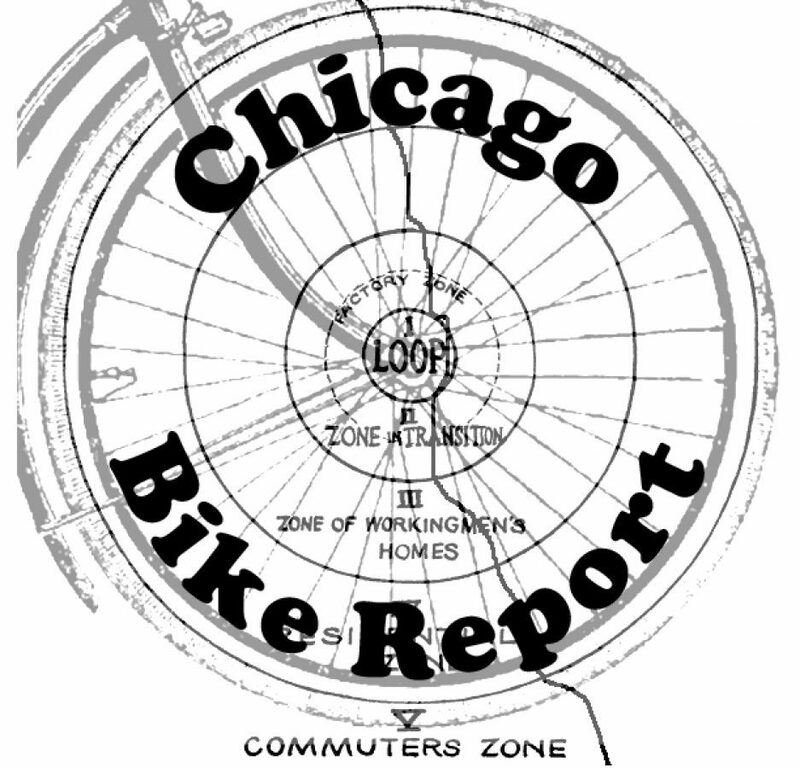 Chicago Bike Report will be changing its format in the coming days and weeks. Will we see more feature stories? Probably. Regular bike commute forecasts? I dunno. In early September I’m riding my bike from Chicago to New York, which means that either way, post volume will decline. But think of all the cool pix of life on the road you’ll get to see. 2 out of 4 stars. Even if you don’t ride, go outside! Overall: high 82, low 66, sunny, windy from the west. DIVVY REPORT: State and 29th, long thought vanquished, returns. A symbol of our noble city itself, rising from the ashes of 1871 to ever-greater greatness, etc. 3.5 out of 4. GREAT! Thursday: good commuting weather marathon comes to an end. 2 out of 4 stars. In the realm of mediocre. DIVVY REPORT: A new station opens at Chicago Ave. and Dempster St. in Evanston. Hooray. Up-to-the-minute updates here. Isn’t this nice weather getting boring? 3 stars. Marked down for possibility of rain. Click here for news stories, analysis, and featured posts. Commuting by bike in Chicago? Find out everything you need to know here. A hobby blog. We try to post all forecasts by 10pm the night before.